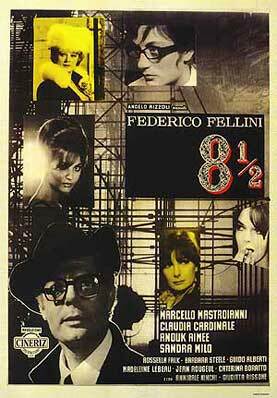 It was supposed to be his ninth film but Federico Fellini was grappling with dilemmas of an auteur on the brink of a major life crisis so he chose to use the medium to explore his own state of mind – and what a wild place that was. Casting his favourite actor Marcello Mastroianni as the director Guido, he reveals a man besieged by producers, actresses, a wife and a mistress all wanting answers to big questions just before the cameras are due to roll. 8 1/2 begins with Guido in his car suffocating in a gridlock then floating free above the traffic like a kite, only to be dragged back down to earth by his own character. Sound strange? Well, this entire film is like that: full of dreams and fantasies and wildly exaggerated reality. Guido wants to tell the story of his life from his charmed memories of childhood, being lovingly bathed in the first press of wine and swaddled by adoring females, to nightmares with his harem of wonderful women suddenly revolting in a feminist uprising. Trouble is, he’s not quite sure how to portray his story, nor indeed if he really has anything to say. In the end, it doesn’t matter because the images that Fellini creates more than make up for any lack of straightforward narrative. The meeting with La Saraghina, for instance, is pure primal humanity with young Guido goggle eyed at the raunchy Rhumba being performed by the wild wench then punished for his sin by the Catholic fathers. There’s even a crazy spaceship being built for the film, a vast tangle of scaffolding erected on an Italian beach for what reason it’s not quite clear. But the actual production never gets off the ground. Instead we bear witness to a celebration of life and the marvellous characters that inhabit the world of show business all to the playful tunes of composer Nino Rota.